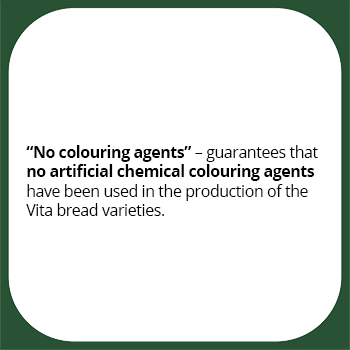 The “No preservatives” seal on all Vita bread varieties guarantees that no chemical preservatives have been used for achieving the shelf life of the products. We introduced a new, improved technology in the production process, which allowed us to use live starters and naturally obtain the long shelf life, while at the same time improving the taste and flavour of the bread. 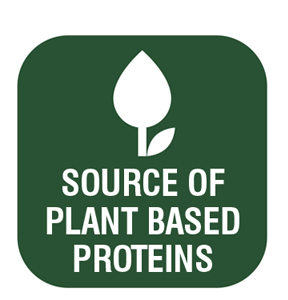 “Rich in plant proteins” – this guarantees protein content of more than 16 g per 100 g of product.. 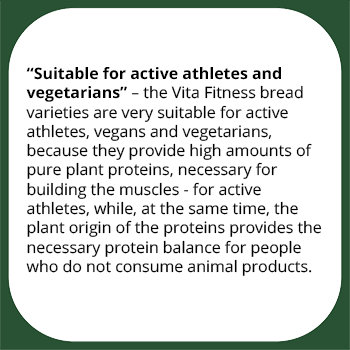 This gives us the ground to refer to Vita Fitness bread varieties, which maintain this claim, as “protein” bread. 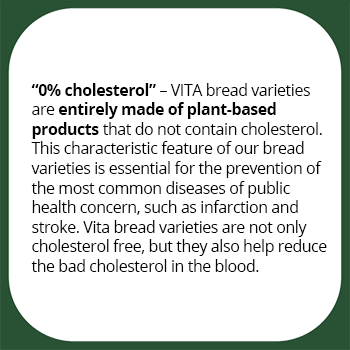 Proteins in Vita bread are entirely plant-based and have been obtained by studying and combining different types of seeds, grains and nuts in the bread recipes. They are the perfect product for active athletes, energetic and dynamic people. For those following a high-protein diet, this bread variety offers them the opportunity to include bread in their menu again. 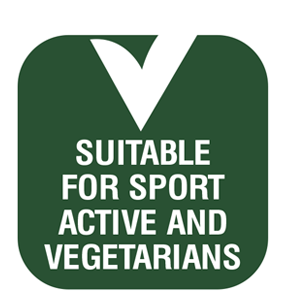 “100% whole-grain flour” – only 100% whole-grain flour (obtained from grinding the whole grains without taking anything out) has been used for the production of the Vita Silhouette and Vita Fitness product range bread. This guarantees that all components of the grain are preserved in a combination balanced by nature. Adding sprouted grains, seeds and nuts further strengthen and develop the healthy benefits and taste of bread. 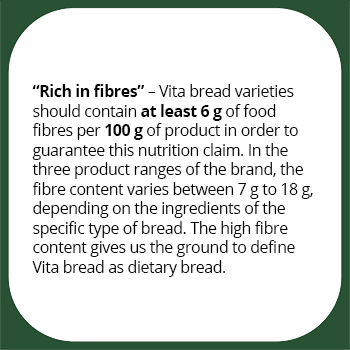 “60% whole-grain flour” – the Vita Balance product range is made of 60% whole-grain flour and 40% fine white wheat flour, which guarantees the dense, but softer structure of bread. The bread made using this technology is characterised with a perfect balance between taste and healthy benefits and naturally adds the rich taste of the whole grain to the menu, whereas the added super grains and seeds further develop the taste and provide additional healthy benefits. How to read the nutrition information on the label? 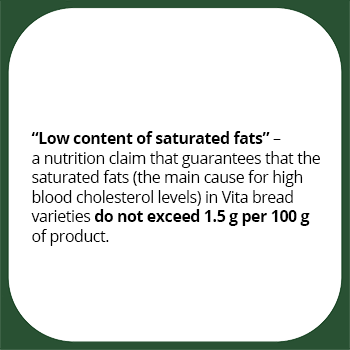 The information in the table of nutritional facts (calories and nutrients) is based on 100 g of product and on one product serving. This information will help us plan and calculate the amounts of nutrients when consuming the product. If we consume more than one serving, we obtain more of all other nutrients described on the label. This is especially important when we count calories, fat, carbohydrates, etc. The declared nutritional values are average values based on a laboratory chemical analysis of the food product performed by an accredited laboratory. The values indicated on the labels are average, because some regulated tolerances are possible, which are acceptable differences between the nutritional values indicated on the label, because it is not always possible for the product to contain the exact levels of the nutrients declared due to numerous reasons, such as natural changes and variations in the nutritional values of the ingredients used. Calories constitute the energy we get from food. We need a certain amount of calories /energy/ every day, but if we consume more calories than our body needs in one day, this can cause us to gain weight. The amount of calories is indicated for one serving and for 100 g of product. Proteins support the building and maintaining of muscles. 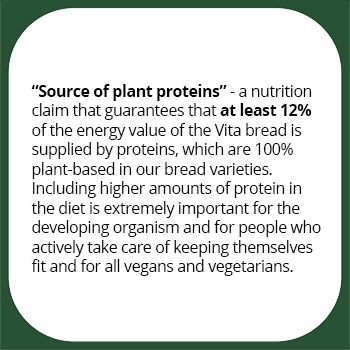 The proteins in our bread are plant-based, which makes them particularly important for people who do not consume meat, active athletes, pregnant women, children and teenagers. The saturated “bad” fats are dangerous for the human body, because they are usually not digested by the organism and therefore their consumption through the food should be controlled. Therefore, their proportion is indicated in the table of energy values. 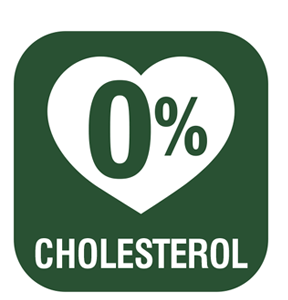 If more saturated fats are consumed, they are stored as body fat in the organism and cause obesity and metabolic diseases. 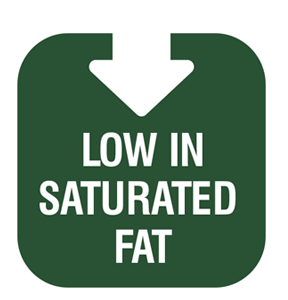 In order to eat healthy, it is recommended to choose foods with low or no saturated fat content. Carbohydrates are a major source of energy for the body, but while slow carbohydrates are beneficial for the organism, they provide power and energy for a longer period of time because of their slow digestion, and do not cause sharp rise in the blood glucose level, fast carbohydrates (sugars), by contrast, bring almost no benefits, with the exception of bringing pleasure and delight. On the other hand, the excessive consumption of sugars causes obesity and serious metabolic problems. 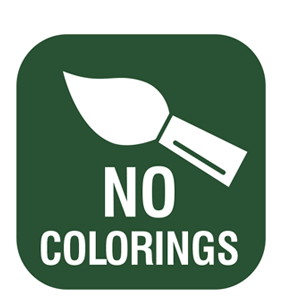 Therefore, the sugar content in food products must be mentioned in the energy tables. It is recommended to choose foods with lower sugar content. These are the so called nutritional fibres. These are nutrients that are very beneficial for the gastro-intestinal tract and digestion. 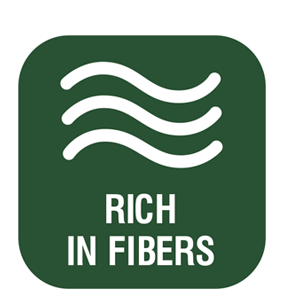 Fibres obtained from whole grains are especially good for us – these are the fibres supplied by whole-grain breads. The European Food Safety Authority (EFSA) recommends to limit sodium to 2400 milligrams based on the consumption of 2000 calories/day. 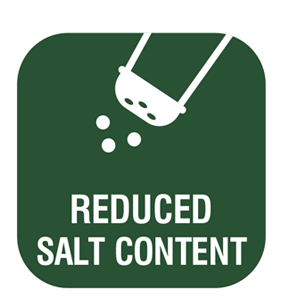 The excessive consumption of salt may cause various health problems. 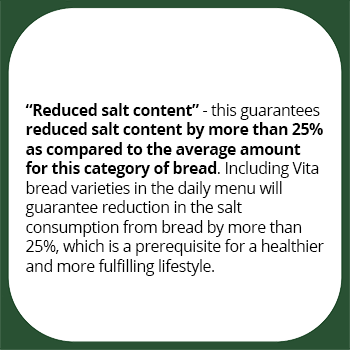 Therefore, our Vita bread varieties have 25% lower sodium content as compared to the average values for this category. These are important nutrients necessary for the proper functioning of our organism. The system of “bread units”, which shows the carbohydrate content of food, has been introduced in Bulgaria and it is used to easily regulate and calculate the consumption of carbohydrates. 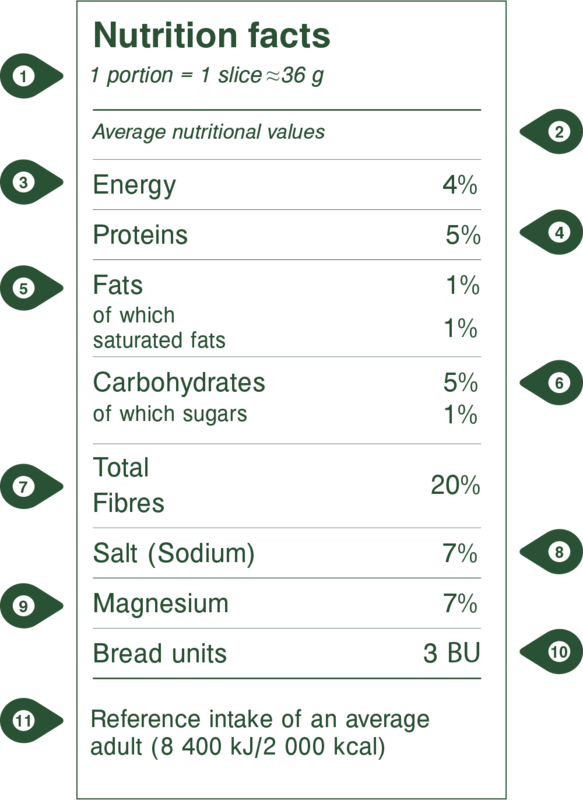 One bread unit is a quantity of food that contains exactly 12 grams of sugar. These are the recommended daily values for specific nutrients recommended by the European Food Safety Authority (EFSA). GDA helps us keep track of, increase or reduce the consumption of certain nutrients where necessary.